One of the most intriguing new fabric developments of late is the breathable workout suit which has been engineered at the Massachusetts Institute of Technology (MIT) with researchers from the New Balance sports brand. This suit features ventilating flaps lined with live microbial cells that open and close in response to changes in humidity. 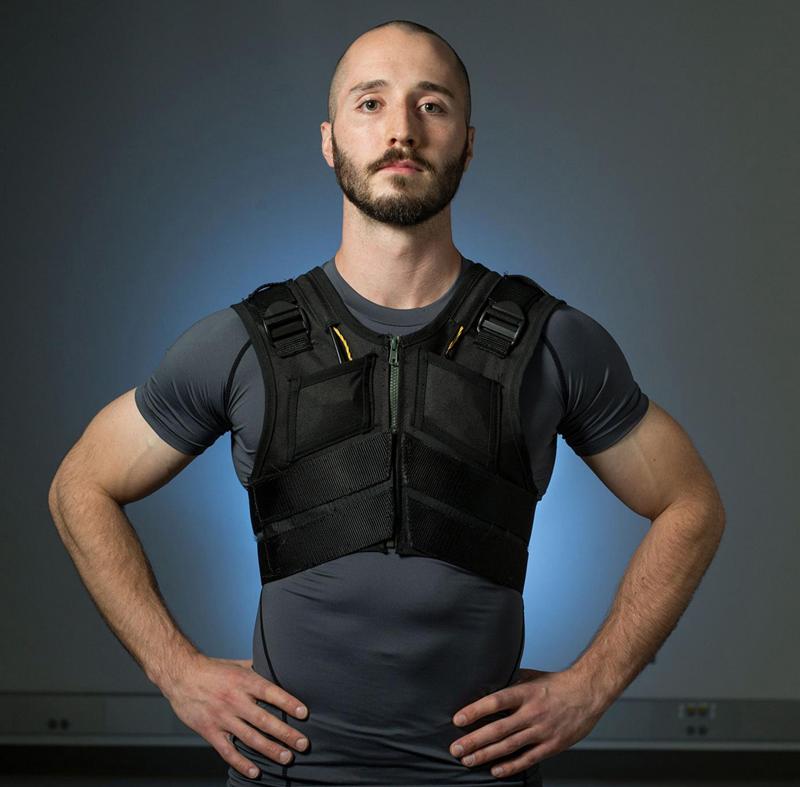 The cells act as tiny sensors and actuators, driving the flaps to open when an athlete works up a sweat, and pulling them closed when the body has cooled off. 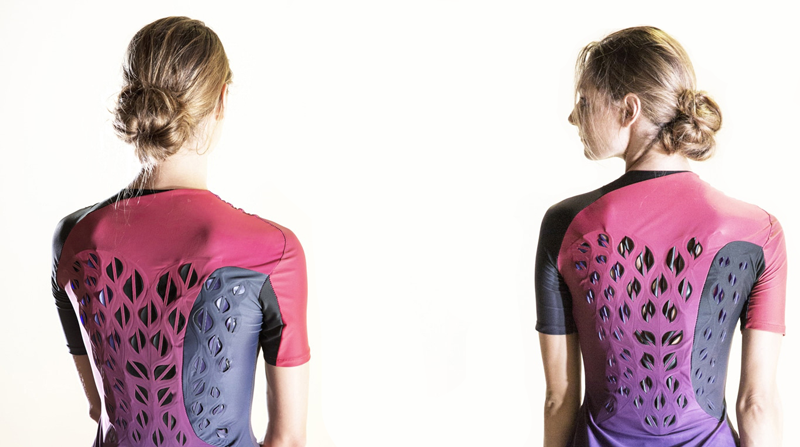 MIT’s breathable workout suit features ventilating flaps lined with live microbial cells. The researchers say that the moisture-sensitive cells require no additional elements to sense and respond to humidity. The microbial cells employed are also proven to be safe to touch and even consume. What’s more, with new genetic engineering tools available today, such cells can be prepared quickly and in vast quantities, to express multiple functionalities, in addition to moisture response. Needless to say, articles exploiting this development are some way off appearing on the high street – yet fabric concepts that just a few years ago seemed futuristic are now gaining commercial momentum and the era of electronic functionality in clothing is very definitely upon us. DowDupont, for example – the multinational corporation with annual revenues approaching US$50 billion – has just announced its new Intexar brand for smart clothing technology based on its latest generation of stretchable electronic inks and films. A smart fitness shirt employing DowDuPont’s Intexar, to enable real-time monitoring and data collection. 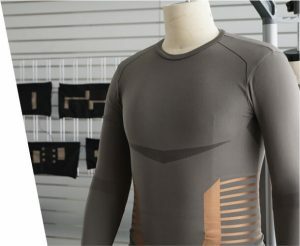 Canadian smart fabrics manufacturer Myant has just launched a proprietary brand of smart apparel called SKIIN. It collaborated with flat knitting specialist and ITMA exhibitor Stoll. “The demand for smart fabrics has never been higher as companies race to create garments, wearables, industrial, defence, healthcare and household items to connect humans to the Internet of Things,” says Stoll’s CEO Andreas Schellhammer. Perhaps the biggest indication of the advent of smart fabrics is the success of BeBop Sensors which is now delivering its smart fabric sensors to Fortune 500 companies in the health, automotive, IoT and augmented/virtual reality markets. A proprietary combination of fibres makes BeBop’s smart fabric piezoresistive. This means the fabric’s electrical properties will change when the material is strained in any way. The company has just closed a funding round in which it raised over US$10 million. Myant’s Skiin brand has launched sensor-containing under garments. But spare a thought for conventional cotton fabrics. How do you find anything new to say about them? ITMA 2019 exhibitor Buhler observes that until now, cotton hasn’t been thought of as a performance fibre, but new advances in technology are enabling cotton fabrics appropriate for sports and active-wear to be developed. The company’s TransDry retains while providing the moisture-transfer qualities usually associated with synthetics. Cotton Council International (CCI) is meanwhile linking up with a range of partners to introduce new performance properties to Cotton USA-branded fabrics. 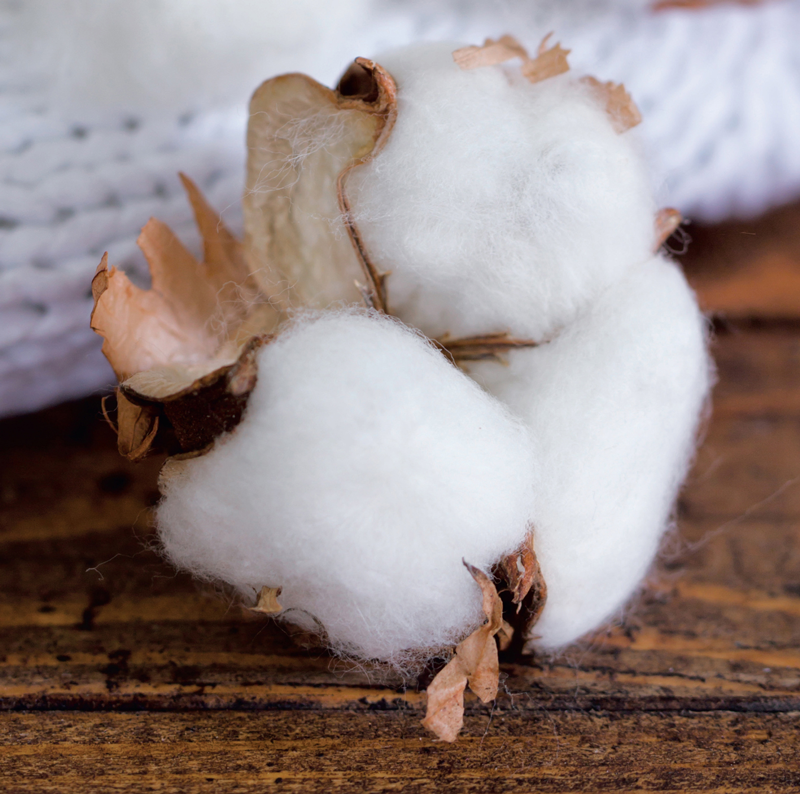 Cotton Council International (CCI) is promoting new performance properties for its Cotton USA-branded fabrics. Argaman Technologies, with its CottonX skincare technology which helps promote skin regeneration. US partner Celliant, with its patented Hologenix technology for imbuing fabrics with a natural blend of minerals which aim to recycle the body’s own energy. Thailand’s Life Materials, with its Life Natural technology based on renewable plant extract to deliver long-lasting freshness by inhibiting bacteria. Italy’s Solucell, with SolucellAir cotton yarns which are engineered with sophisticated hollow channel structures to light weight, soft touch, thermo-regulating and possess moisture management properties. And let’s not forget wool. Woolmark will be promoting its advantages at ITMA 2019, having recently partnered with adidas to develop new performance applications for the fibre. “Collaborating with an industry leader such as adidas allows us to showcase the natural benefits of Merino wool, including thermo-regulation, anti-odour properties and movement, in the context of cutting edge design and innovation,” says Woolmark’s managing director Stuart McCullough. In addition to its comprehensive technology halls, the exhibition will have a sector dedicated to Fibres, Yarns and Fabrics at the Fira de Barcelona from 20 to 26 June 2019, in addition to a dedicated showcase of Research and Innovation. See also, the short film, Fabrics Unexpected, here.